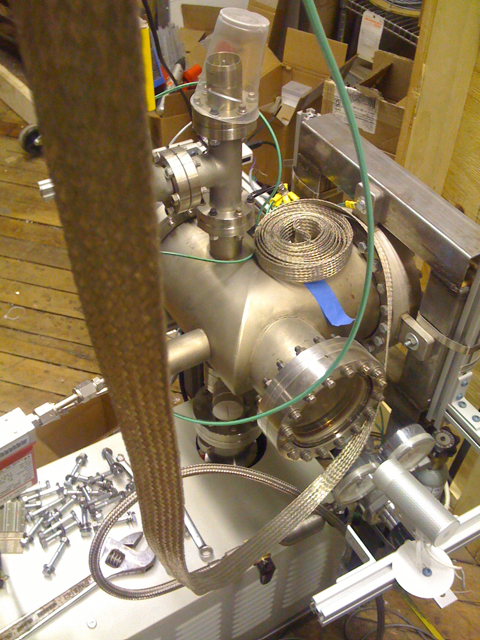 The HV duty cycle lets us do fusion trials without melting the grid. 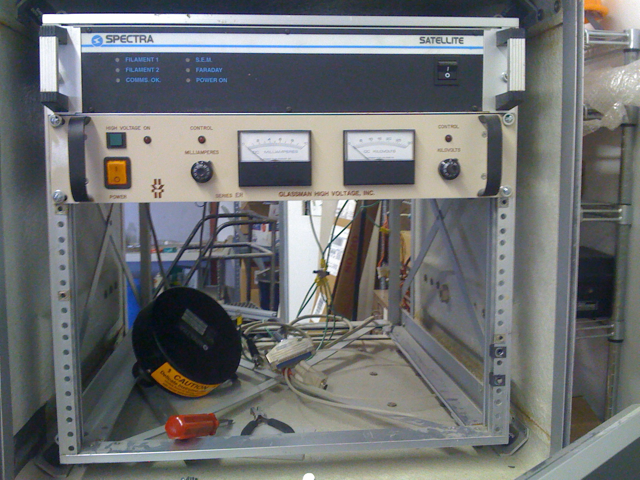 Something I’ve noticed: when the plasma becomes unstable and sparks… it crashes the data acquisition card. I’m guessing the sparks are creating powerful EMFs. We may need shielding. 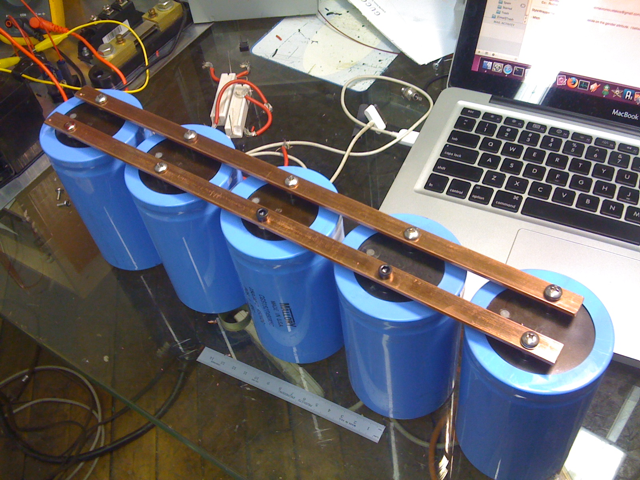 Fabricated the second row of capacitors. 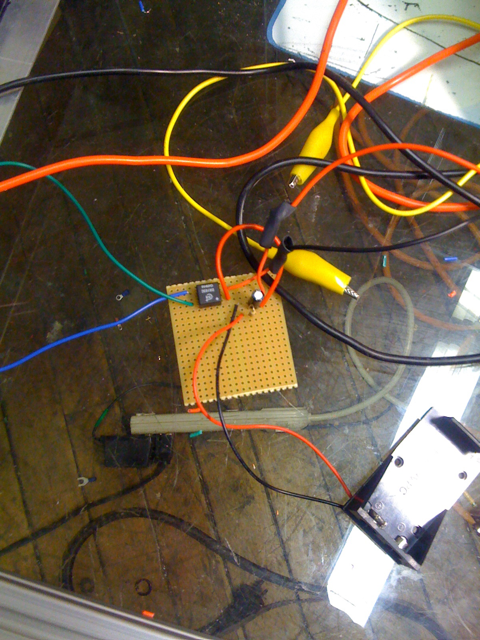 I have one capacitor left…so we can take it to 11 when the time comes! In other news, I got Windows XP running on my macbook on a separate partition. 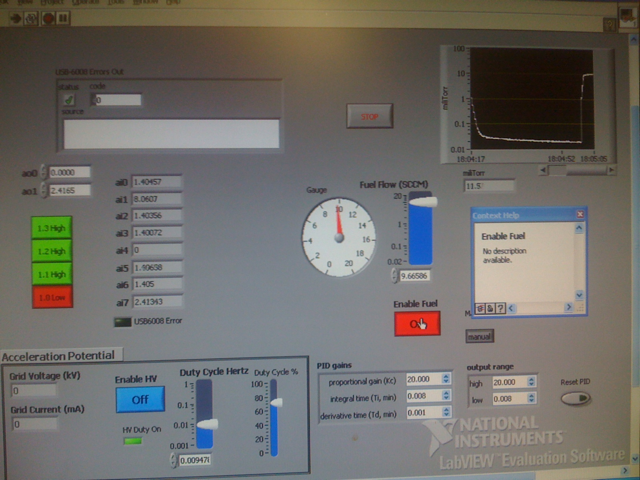 Also got LabView installed. More on that later. 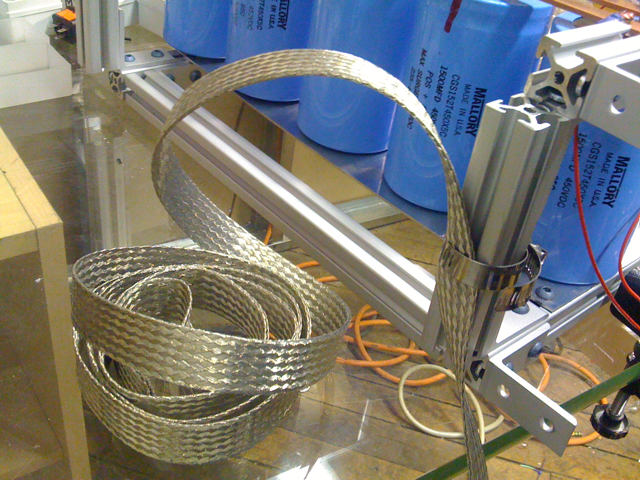 Later inspection revealed less then fantasic electrical conductance between the ground cable and the aluminum chassis. 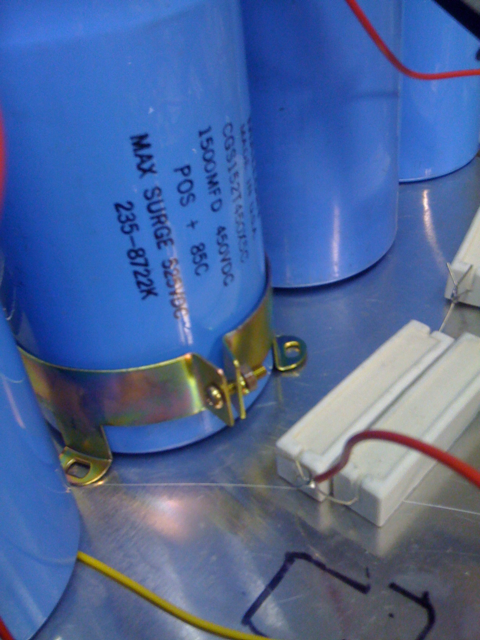 When the SCR discharges you can see the coils flex and hear a sound from the SCR… and the voltage across the capacitors drops sharply. 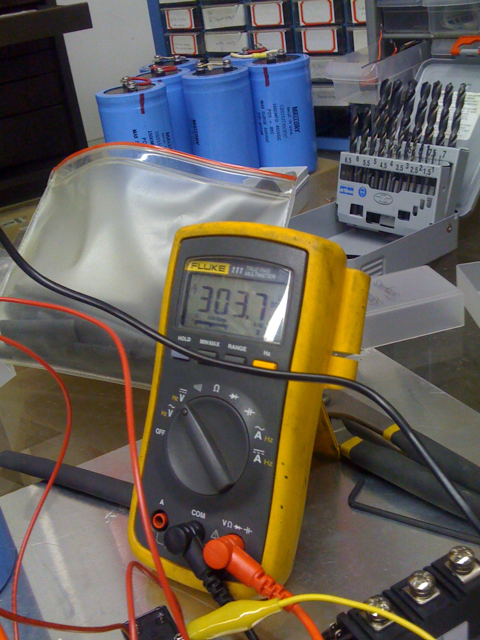 I took it up to 400V with 5 caps. 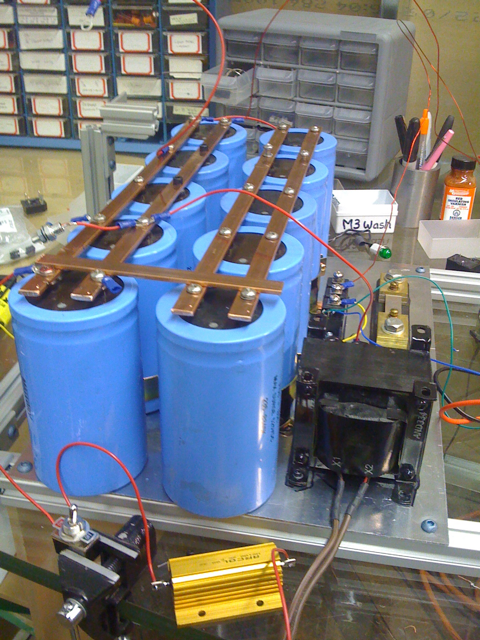 Pretty major step forward for the coil power supply. 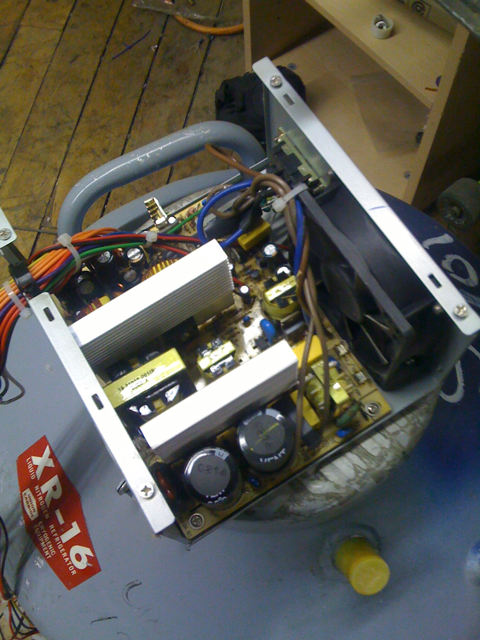 Making a front panel with master power switch, AC indicator, capacitor bleed switch, high voltage LED indicator. On the back panel: IEC C14 AC connector, screw down terminals for coils power out, and D-sub interface for computer control (via DAQ). I want to computer control the AC power, bleed resistor and SCR triggering. 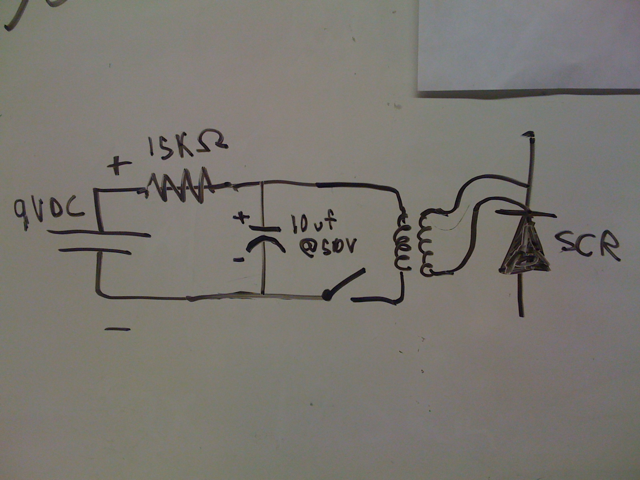 Stuart made a keen observation about a relay on the DC side: Relays have a much lower voltage rating for DC vs. AC. 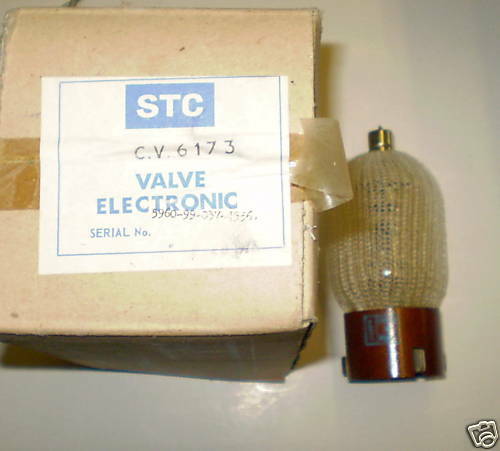 So a relay rated at 240VAC may only be rated at 30VDC. 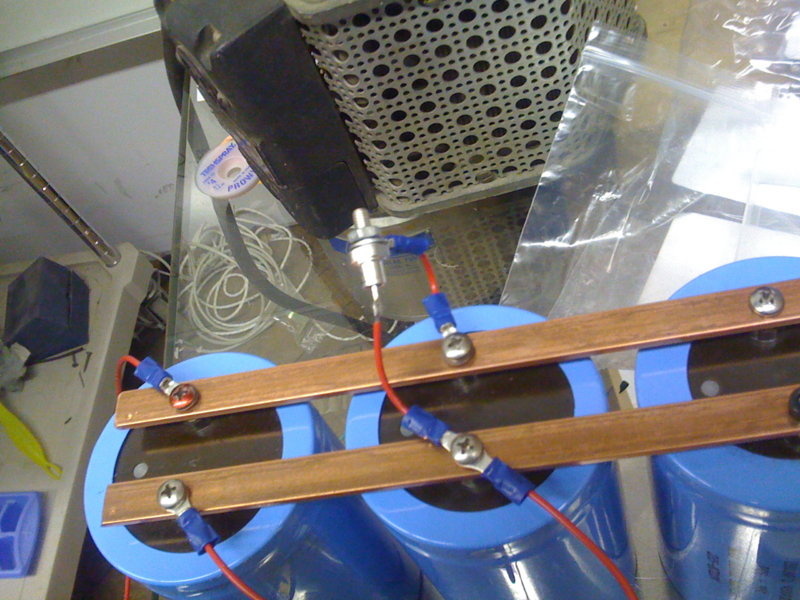 This is because DC sparks are harder to quench- they don’t naturally drop to 0V like AC does. So long story short – I’m going to put the relay on the AC side of the transformer. I also want to fuse the AC and DC sides. I can purchase and build. Send me schematics and part numbers. 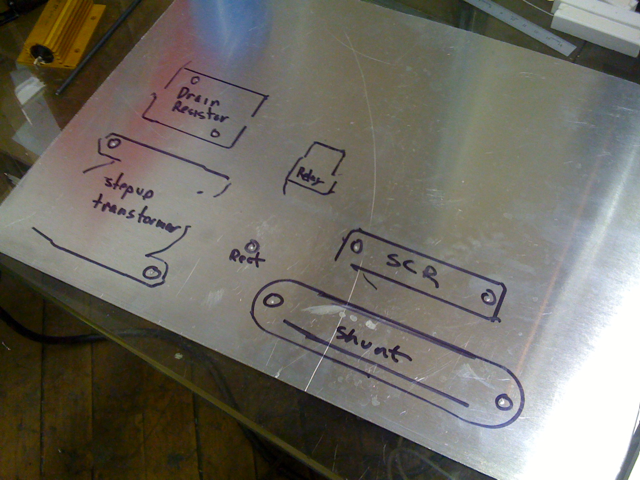 Provided it’s pertinent to the research and within the budget… I will build it. Here is the schematic for it’s use. Design a modern version of the triggering circuit shown in this schematic. ie, without using a “break-modulator valve”. Wire it up for a test charge. 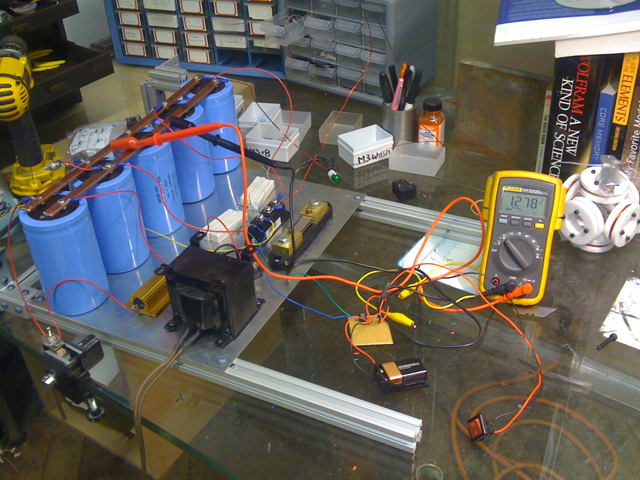 This time we are charging through a 1KΩ 50W resistor network. Everything seems to work as expected. Excellent day in the lab. I got the elevator key copied, so I’ll never get locked out of the lab. 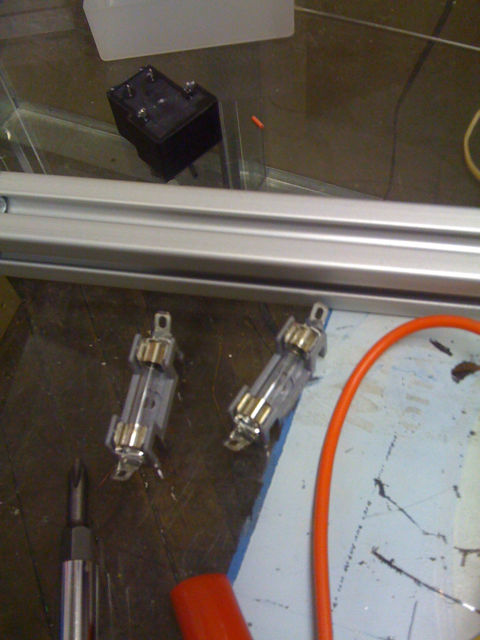 I did a successful test of the mechanical relay. 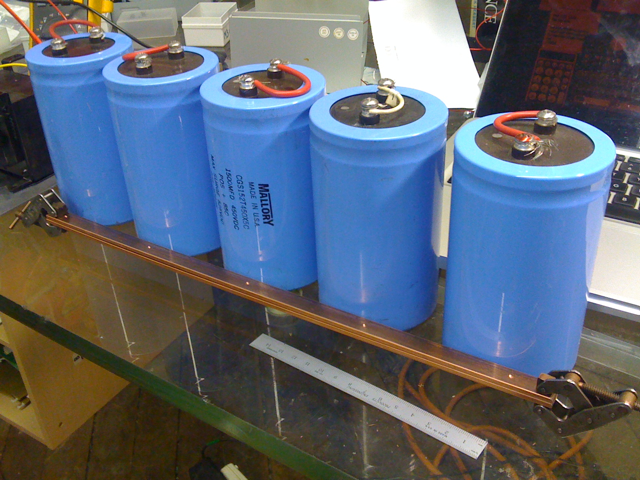 Once the capacitor is charged… it holds its charge without much dissipation after the variac goes off. But during my initial testing it started squeeling and soon blew its fuse! There was no short circuit that I could see, so perhaps it just died of natural causes? 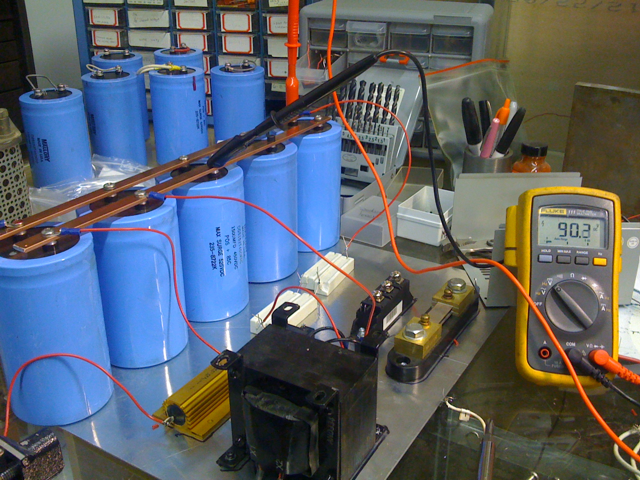 Anyway… it reminds me: I should fuse the coil power supply before I go much further!